Years ago I was chased by a bull. A ground-pawing, snorting, massive animal right out of a cartoon who drew a bead on me and began to attack from about 30 yards away. The gentleman I was with ran too, passing me in a heartbeat, and yelling “Pick up a stick!” over his shoulder. I glanced at the ground to find nothing bigger than a twig on the ground, decided through careful deliberation that it probably wasn’t going to stop a fifteen-hundred pound animal charging at full speed, turned and ran as fast as I could toward the fence. At the last moment I made it through, where I and my hero stood panting in relief. We turned to walk away, and my right leg collapsed underneath me while I shrieked in pain. I’d sprained my ankle. Badly. But I hadn’t known it until I began to calm down, because one of the functions of adrenalin is to mask pain. Dr. Zink backed this up by showing us multiple videos of dogs, most running agility courses. The dogs looked to be sound and healthy, until you played the videos on slow motion. What an eye opener! This should not be a surprise to me, trained as I was as an ethologist in analyzing behavior in micro-second units. But it was still shocking to see how many dogs looked “fine” in real time until you slowed down their action to see that they were avoiding fully using one of their limbs. 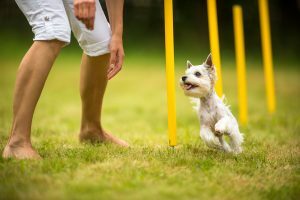 They might avoid leading with the correct leg on turns because it hurt them to do so (easily seen while moving through weave poles), or simply shorten the stride length of one leg while trotting beside their owners. Every one of us should video our dogs on a device that converts to slow motion (most new iPhones do by the way). Ideally we do it when they are 100% healthy for a comparison, but slo-mo videos of dogs at any stage of life are invaluable. (Don’t put the movie on Youtube and expect an expert to be able to analyze what she sees—Youtube movies are too low resolution.) After videoing we need to learn what to look for, including using the correct lead leg on turns (the inside leg) and equal stride length of both legs. Ideally, you can find a certified veterinarian or canine rehabilitation specialist in your area to analyze your dog, because it takes no small amount of experience to see some of the subtle signs of imbalance or discomfort. 2) Many injuries are caused by over exercise rather than an injury from a fall or other discrete event. Soft tissue injuries are often the result of “repetitive strain” which can damage tissues and create scar tissue, which can never function as fully as before. Dogs also need to be warmed up before hard exercise and cooled down afterwards. They often aren’t. 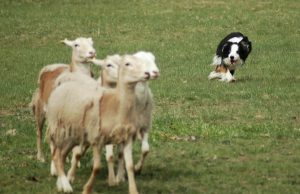 That’s certainly been my experience at sheepdog trials—the primary concern at trials appears to be giving your dog a chance to potty and letting her watch a few runs beforehand so that she sees where the sheep will be set out. I asked Dr. Zink to define “warmed up” and she said your dog is warmed up when she begins to pant lightly. (It turns out “warm up” is not just a metaphor, the muscles actually do warm up.) I’ve always had my dog stretch before my runs, and cooled Maggie down after her runs, but I know now to warm her up more thoroughly before she competes. Question for you: What’s common at agility trials? I’ve seen plenty of dogs go straight from the crate to their run, but I don’t go to many anymore, so if you compete, tell me what’s common. Slippery or inconsistent surfaces can create a lot of problems too. This makes perfect sense, and is something you can control when practicing or even competing. This reminder, however, causes me no small amount of angst, because working sheep dogs like Willie and Maggie have to bring the sheep in for their evening grain no matter the weather. But we can all be more mindful of what we are asking our dogs to do, and the potential risks associated with it. It’s also beneficial to massage your dog after extreme exercise, including their feet. Willie and Maggie say yes to this. Stretches are good before and after too, and it’s best if your dog does active stretches (ie, does a play bow rather than you stretching a leg for them). 3) Make friends with your dog’s muscles. All of us should evaluate our dog’s muscles once a week with the dog in a standing position. Get familiar with your dog’s muscles, especially the hamstrings, quadraceps, paraspinals, lateral and ventral abdominals, and shoulder muscles. Are they firm or soft? Larger on one side than the other? Don’t stop with your own dogs, feel the muscles of as many dogs as you can to begin to get a feel for the range of possibilities. Note that a dog’s muscles should not shrink in old age—contrary to what we might assume, it is not normal for a dog to get weaker as it gets older. 4) Recognize all the possible signals that a dog is in pain. Besides changes in movement, we should also look for “calming signals” like yawning, stretching, looking away, etc. Refusals to sit are often a sign that it hurts a dog to do so (fyi, don’t try to get a puppy to do a “straight sit” until he is over 6 months old). In general, any reluctance to train or a change in a dog’s performance should be first addressed by asking if the dog is in pain. I don’t begin to have the eye that Dr. Zink does, but I can tell you I have had many clients whose dogs made it clear to me that their behavior was related to pain. I’ll never forget a dog who was about to be euthanized because he’d bitten several people. He’d been a social butterfly for years, but lately had growled, snapped or bitten people reaching toward him. His vet said he was “fine”, but even I could see he seemed to hold his head slightly tilted to the right. It wasn’t extreme, it was actually quite subtle, but no matter which way the dog moved, his head was always held in a slightly unnatural position. The client, bless her, took my advice and got a second opinion. After medical treatment for a neck injury that had never been treated, the dog went back to being a model citizen. 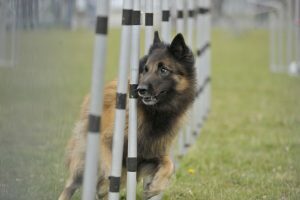 5) People involved in high powered dog sports don’t need reminding how important it is to get exercise, but it’s good to know that aerobic exercise (dog is panting or we are slightly out of breath) increases neurogenesis or cell division in the hippocampus, increases the plasticity of the brain as well as over all longevity. I will remind myself of that when the days get darker, the wind comes up and the couch is seductively soft and cozy. 6) All active dogs should get 3 supplements: 1) Joint protective supplements, which I presume to mean some combination of glucosamine, chondroitin and/or MSM, 2) Probiotics made especially for dogs in capsules that stay solid until reaching the gut. (She mentioned Geneflora as one of her favorites), and 3) Omega 3 fatty acids, which must provide 15mg per pound of DHA. — Schedule an appointment when your dog is healthy, bring or send videos of activities you will be doing with your dog. — Bring a written document including the dog’s diet, supplements, and complete history of your dog’s health, injuries etc. 8) If you suspect an injury, go to an expert in canine structure or sports medicine. Ideally, we would all have Dr. Zink’s clinic next door, because her credentials include: Veterinary Pathology (DACVP) and Veterinary Sports Medicine and Rehabilitation (DACVSMR), Canine Rehabilitation (CCRT), Veterinary Spinal Manipulation Therapy or Chiropractic (CVSMT), and Canine Acupuncture (CVA). Most of us don’t have the luxury of living next door to Dr. Zink, but I’ve benefited more than I can say from the care of Courtney Arnoldy at UW-Madison. I know I am lucky to have someone so close, but if you have to, I’d say it’s worth it to travel to an expert if you possibly can if you have a dog with a suspected injury. This was just one of the great talks I saw at APDT in Richmond; I’ll be writing about some of them in weeks to come. Were you there? What talk(s) did you find most valuable? Here are a few photos from my time in Richmond. Starting at top left, clockwise: Here’s Heidi and Willie’s Perpetual Pig. WPP has raised $10,000 for the ADPT Foundation so far at auctions and has its own Facebook page. Let’s hear it for the power of the pig; me and Dr. Chris Zink being silly; Pilot’s mom–who you might recognize from Love Has No Age Limit who I loved getting to meet in person; me and friend and colleague Meg Boscov of Pup Up Social Learning; me all over friend and colleague Sue Sternberg; getting to meet the woman who named Meryl Sheep, Stephanie Berry, and the beautiful award given to me by APTD. Who knew it would be so gorgeous? MEANWHILE, back on the farm: I’m just getting my paws back on the ground from trips to Oregon (grandkids, oh my!) and APDT in Richmond, VA. I’m still a bit gobsmacked about receiving the Lifetime Achievement Award from APDT this year. And thank you to all of you who took the time to come up and say kind things. Gosh. I’ll be writing more in weeks to come about other talks at the conference, lots of great information to mull on. Now that I’m home, it feels a lot more like fall since I returned. It has been strangely warm for the last few weeks. 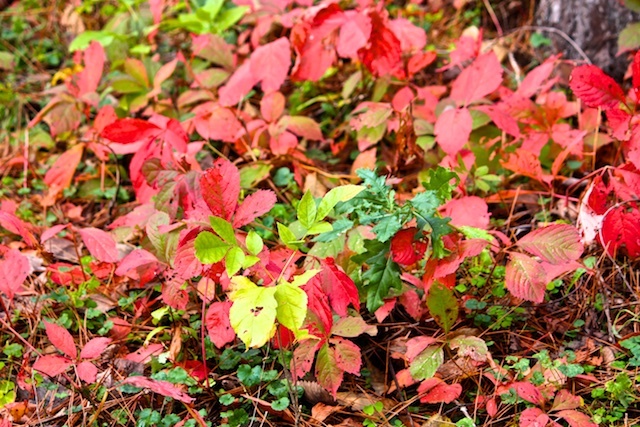 It’s been a weird one for color–the leaves didn’t seem to be changing, and then they did in an instant, as if someone fast forwarded the “fall color videotape”. But it’s good weather to plant bulbs; I’ve planted about 60 new ones, only another 250 to go. Below is some of the woodbine vine that is the brightest thing in the yard right now. Can’t post more photos… time to go work Maggie and plant some more bulbs! I compete in agility with my corgi. The warm up routine I do with her has evolved over time, as has her veterinary routine. Becca has chronic Lyme and has injured a shoulder quite badly before. At age six she still hasn’t realized she is only eleven inches tall, she’s all in. Her Lyme has kept me hyper vigilant about any limping or soreness. Becca’s vet raises corgis and also competes in agility. The vet also does acupuncture and chiropractic. Becca goes in for a tune up about every 4-6 weeks. She knows Becca well. If I say that Becca is swinging a little wide with a front leg or is popping out of the weaves she understands me. Becca also has had canine core fitness lessons. We practice this a few times a week. As her core has become stronger she has had fewer injuries. Her fitness instructor has helped me come up with a warmup routine. We complete it before each run. She doesn’t always pant. After reading this I’m going to look into upping her routine. Some dogs do still go crate to ring, but many people have a warm up routine of some sort. A friend has been talking to me about how we need to add a cool down routine. You have prompted me to do some more research and plan how to add it in. 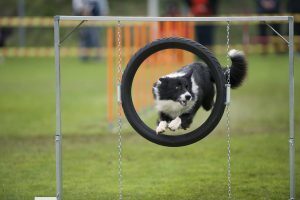 When I did beginner agility in the UK, one class stood out from all the others, with their emphasis on safety (especially for the dogs! ), warming up, slowly building up height and distance, and overall professionalism. Even there, though, Sophy’s very obvious reluctance to jump was put down to lack of the right motivation. I stopped going, as it was clear she was never going to enjoy that part, much as she loved the A-frame and dog walk that got her up to the same level as humans. Years later she had a ruptured disc, and I castigated myself for not recognising what was probably a grumbling problem when she had worked so hard to tell me. It has just flared up again this weekend after she slipped leaping off the bed at the crack of dawn to sort out a squabble between the cats – anxious times, but now I know to start crate rest and pain killers immediately, and have an excellent osteopath who saw her as soon as possible. My vet, understandably, tends to emphasise the potential dangers of not complying with his instructions for treatment – I have lost count of the number of people I know who have let their badly injured dogs and cats out for a run around because “it seems so cruel to keep them caged up”! The osteopath is always wonderfully reassuring and brings down my shoulders and blood pressure, as well as very definitely making Sophy feel better and speeding her recovery. Between them we get the best of both worlds. Slightly off topic, but I would greatly appreciate links to canine core fitness lessons for small dogs. Once Sophy is out of crate rest we will be into winter weather, and walking may be limited, so it may have to be hydrotherapy and indoor exercises. Thanks for (yet again) an interesting article. Although I don’t do any sports with my greyhound I’ve often wondered what ‘warm up’ and ‘cool down’ actually means. I.e. when it is O.K. to let her off for a run… So the definition you’ve given for warm up is really helpful. How would you define ‘cool down’? Is it enough to just put the dog on the lead and let her walk or trot (as opposed to run and chase) for the last, say 5 minutes of the walk before getting back to the (cold this time of year…) car? Does it help to put a coat on for the car? What do others do? Thanks! I love your blog! Thank you for writing it. Regarding supplements – are you sure it is 15 mg/lb of DHA, or 15 mg/lb of DHA+EPA? I have been using Nordic Naturals, and their suggestions are ~15 mg/lb total Omega3 (DHA+EPA). Thank you! What an interesting interesting topic and wonderful article! I am definitely saving this one for a more thorough re-read so I can start implementing these suggestions. Our wonderful Catahoula mix Georgie is a very active dog. We don’t do any competitive sports (although do do some for fun agility classes in the winter) but we hike every week with her off-leash, and she loves to roam and explore. We do a lot of casual “trail parkour” training as well as constant recall reinforcement–so a lot of running and movement. A couple weeks ago when we did our first big uphill hike of the fall season (in summer we stick to flatter terrain with water access), and all seemed fine, but then a couple days later I noticed her going down the stairs very gingerly; up the stairs was fine, it was just down, so I assumed some pain in a front leg or legs. Anyway, we took it easy, by the end of that day she was improved and back to normal (seemingly) by the next day, but we kept the next few days of walks shorter and flat to be safe. I think it was more likely general soreness than any specific injury, but after reading this I’m going to do a more thorough assessment–love the idea of using slow-mo video! We’ve had Georgie 2 years –she’s probably about 4 or 5 years old–and it was one of the only times I can remember her showing discomfort, but she is definitely a stoic, highly tolerant dog so I’m realizing I need to be more vigilant. I’ve also been wondering about the joint, etc. supplements, and I realize I just need to go ahead and start her on those–no point waiting until there are already signs of problems, right? If anyone has suggestions of particular supplement brands, types, etc. they recommend, would love to hear. I have a miniature rat terrier which is a textbook example of pain demonstrating as behavior problems. I found her as a stray, around 3-5 years old, and she was a snappy little dog. Wanted to snuggle, but would be all teeth and snarls at my cat if she also wanted up on the sofa. I figured it was just how she was, especially since small dogs have a reputation of being unsociable and snappy. But then I noticed she wasn’t walking right, holding up her rear legs and hopping for a few steps every so often. Got her checked out by my vet, who recommended seeing a specialist (love vets who are willing to refer out! ), who diagnosed bilateral locating patellas, grade 3-4. Got the surgery (thank God for insurance! ), and now she is a bright, friendly little dog. She never snaps when we snuggle any more, so I am pretty sure that was “hey, it hurts when you make me move in a certain way”. And yes, I love the fact that my vet is perfectly ok with me coming in and saying “she just doesn’t seem right.” They trust that I know my dog, and keep a close eye on her and how she is acting. Videos are very helpful to bring to appointments, too. It’s a lot easier to just show the vet, rather than trying to describe exactly how she is moving. Were there any discussing of the caretaker placebo effect? That was a fascinating discussion I stumbled on. The basic idea is that caretakers and vets will say that a dog is doing better after treatment, even if objective measures prove otherwise. Which is a hard thing to guard against. Your dog is limping, so you put them on crate rest for a while, and then slowly start building up the exercise again. Is your dog limping less now than when you started? Most people will say yes. But, if you do weight-bearing analyses (using special machines that measure how much weight the dog is putting on each foot when they walk), you can find that there is no difference between pre and post treatment, even though the owner and the vet say that there is. It was an interesting article. Carol – Trisha quoted me correctly – it is 15 mg/lb of DHA. The appropriate amount of EPA will come along with the correct amount of DHA. This dose is the amount suggested by a number of studies for prevention/treatment of cardiac disease in dogs. We don’t have studies in dogs specifically for the anti-inflammatory dose, but we feel that 15 mg/lb of DHA is also the best bet for that. I know it can be confusing, but it is important to check the doses that your dog is getting in your product. Sometimes companies quote the lower doses that are good for skin and coat, for example, but the anti-inflammatory doses are higher. Nordic Naturals is one of the best sources, by the way. From the exercise science on humans, the growing consensus seems to be that gentle warmup exercise is good but pre-exercise stretching does nothing to prevent injury. This likely applies to dogs. Thank you for the amazing summary of Dr. Zink’s seminar! I’ve just now been reviewing all of my notes from the conference and figuring out how I can use everything I learned for my own personal dogs but also for the hundreds of dogs I’m responsible for in daycare every week. You summarized her seminar far better than I ever could have! I look forward to reading more of your summaries from the conference. Ever since I got home I’ve been watching my dogs for signs of pain, injury, and lameness and asking myself a million questions. Has Nimbus always done that in the weave poles? Or is he doing something different? Is Icey’s stride different? Do I need a slo-mo video so I can show my vet what I think I’m seeing? Is Bailey’s back end bothering him or is he just wiggly? Definitely time for some videos for and conversations with my vet! With regards to the conference, there were too many great seminars to choose a favorite! I particularly enjoyed hearing Suzanne Clothier’s insight on determining the right size world for each dog and Dr. Spaulding’s summary of the presence (maybe?) of dominance hierarchy in dogs. The round table panel on incorporating research in to training was also really wonderful! Thank you for continuing to share your knowledge and experience with all of us! In the mid-Atlantic region I see some people warming up/cooling down their dogs at agility trials; there’s lots of “out of the crate, run, back into the crate.” And that’s with Dr. Zink living locally! I don’t know what it will take to break down the barriers to get people to commit to this healthy routine for their dogs — and themselves. Frances- I go to Fitdog Maine in Portland. The trainer uses a lot of totofit equipment. You could try messaging either of those if you are in New England. Back to agility trials, I think space is an issue at some venues. Sometimes it is hard to find a spot to warm up. Great post, Trish! It’s a keeper. I’ve been following Dr. Zink for many years (i.e. articles). Thanks for sharing. Congrats on your award. SO well deserved. Have a “wooonderful” week! I do agility, admittedly I have run crate to course. Especially if I am 1st dog. The majority of the time I do warm up my dogs by jogging around with them. I am athletic myself, and you feel so much better with a warm up. I actually injured my hamstring running a dog walk cold. It has hurt x1 year now. At class we rotate runs and there the warm up is difficult. However, by reading this I do not do it long enough “light panting”. I would feel so bad if my dogs hurt. Now I am worried, Kaiser does yawn sometimes. I actually questioned if he annoyed or something or wanted not to run. Uggggg FOR THE LOVE OF DOGS!!! I do know they love the game. I will just have to pay attention. What was the name of the class? Is it the same as the one coming up In Milwaukee? Carrie, the Zink seminar in Milwaukee is the weekend of the 4th and 5th, so that must be the one you are thinking about. Can you please explain your comment “(fyi, don’t try to get a puppy to do a “straight sit” until he is over 6 months old)”. Why is teaching a puppy a “sit” a bad thing to do? Is it something to do with their growing bones and hips? I’ll admit that as an agility competitor, my dogs do usually go from the crate to the ring. I’ve found that they do best if they get a chance to move out at the start of the day, so if at all possible, I’ll get them for a walk (at least 10 minutes) either on or off leash (I prefer off, so they can move more naturally, but it depends on where we are), once we reach the trial site. This also allows them to empty out, but the primary benefit I find to it is that it seems to get their muscles “ready for action”. They move and jump better on days where we do this. After that, they’re crated, and I don’t make any real effort to warm them up again. It’s usually a bit of a walk to the ring from the crate, and I get them out a few minutes early, and tend to keep them moving. After a run, if at all possible, we play ball for a little bit, so they aren’t really getting a cool off, either. They seem to do alright with this. My oldest dog will be 12 in December, and is still competing (although I limit her runs. Not by her choice.). At her age, I pretty much figure that anything is gravy, so as long as she loves to run, I’ll run her. Q’s are not required, though she still gets a lot of them. Most NQ’s are still because she thinks contact zones are a waste of time. This is not a new issue. I’ve never had any real luck with joint supplements, when I’ve tried them, my dogs did not seem improved. So we don’t use those. I should say, my dogs are Staffordshire Bull Terriers, so even for dogs, they’re absurdly stoic, and wouldn’t necessarily show signs of being in discomfort, but I’ve found that if there is something physically off, it shows in their performance. Weave poles in particular, but also knocking jumps (because jumping weird), and running a titch slower. The old lady dog is more likely to hit her contact zones if she’s a little sore (not as eager to launch early), so that takes some watching. Sometimes she’s just being good, though. If her jumping is smooth and she’s completing her weave poles correctly, I usually assume she’s doing alright. I went out with a client and her 6 month old goldie last night. I noticed ‘something’ odd about his gait, and that his head bobbed in time with one back foot-fall. Is that head bob ever an indicator of pain? Gayla, I would certainly suspect pain. How the dog moves his head affects his weight distribution, so nodding his head downwards as he moves would put more weight into his forelegs and ease off the pressure at the back. Having said that head nodding is usually more marked with foreleg lameness so there might be something going on there too. Gayla – head-bobbing is often associated with lameness in dogs. I assume it has something to do with counter-balancing, the way that you stick out an arm if you are carrying something heavy on the other side. Question about video-taping your dog: how, exactly, should you do this? Just take video of them while they are wandering around? Walk them on leash? Walk, or trot? Straight out and back, or should you include obstacles to step over, bend around, etc? I’d probably be doing this one-person, so having a good idea of what I am trying to get would be very helpful! Thank you for this important (and interesting!) article. Living with high energy dogs (German Shepherds from working lines for 20 years, Australian Cattle Dog for 4 years) that can go from 0 to 100 in half a second I had to learn my lessons about warming up/cooling down – even though we do not engage in agility. They do however (or have done) a lot of nosework like mantrailing or searching for lost items. The most important part for us is keeping calm when starting any activity (esp. the ACD) because all of them love(ed) to work and would go off like crazy if not calmed down before. This would not only have a negative impact on their nosework but harm their physical (and mental) health. So we always do a little walk-around first, then some gymnastics like weaving through my legs, bowing and stretching before going on a search. Three of my GSDs (all of them rescues) had problems with their spine and/or joints – not one of them showed it in their younger years. The only way to recognise that something was “off” was a decrease in the preciseness with which they did their work. They were enthusiastic workers and would never have given up on their job, not even when they had a bad day when they got older. The ACD to a stranger would look like any normal, healthy dog – but he tends to get a little bit short tempered if he doesn’t feel well, which is said to be a trait in the breed itself. I just don’t believe that anymore. It seems to be the way (some) dogs compensate for not feeling well or even being in pain (I can relate to that). And their high drive and their willingness to work makes them disregard their physical well-being (as would a predator hunting for prey). For warming up/cooling down: it’s not only dogs in sports – the same goes for dogs playing together, e.g. at the dog park. Most people get there by car, take out their dogs and let them run off to play and chase each other wildly. Even if this doesn’t count as “sports” – it still has the same impact on the joints and backs of the dogs. I do believe that even here some kind of warm-up could be of help preventing injuries. As we don’t have a dog park nearby, we meet with our friends somewhere outdoors and start our walk on-leash. After a few minutes, the dogs have calmed down, done a lot of sniffing and only then are allowed to run free. This way the dogs also are more relaxed when meeting and greeting each other. Gayla, I agree with jackied and Rebecca that head bobbing could well be a symptom of some kind of pain-related dysfunction. Usually I see ‘head bobs’ when a dog is trying to avoid putting weight on one leg. Think of a person, even, who has a bad leg. As they limp, you can actually see the top of their body move downward. Bottom line, I’d get it checked out soon as you can, especially by someone trained to look for subtle signs of injury. Ranger is a Therapy Dog, not a job that is especially associated with athletic prowess but as I’ve been reading the blog and comments I realized that I nearly always warm him up before a visit and that those time where it wasn’t possible he’s less focused and engaged. I never really thought of it in terms of warming him up before but that’s really what I do when I arrive early and jog him around the outside of the building. We started this because he is a high energy herding type and I wanted to burn a little of the energy before asking him to be calm. It became part of our routine and I noticed that he looked forward to it so we kept it up even though it’s no longer necessary to burn off some energy. I love how this blog and all the great comments make me look at things differently and realize what it is I’ve been doing without really understanding the whys. Thank you. Congratulations on the award! My husband and I have an active dog, a Carolina mix, about four years old. We aren’t involved in agility events, but my husband does like to throw the Frisbee for him outside. They play really hard and have a grand time. But sometimes I wondered if it was too much. I think that warming up is the answer. Even in the house, the dog will yelp and favor one foot or the other while he’s jumping to catch his heavy Kong toys. We’ve just let him keep going once he seems ok. Thanks for another great blog. Sounds like it was a great conference. And congratulations on being awarded the Lifetime Achievement Award!!! This is such important information; thank you for summarizing Dr. Zink’s presentation. We learned about the importance of warming up from our great sports vet, after one of Habi’s many visits. 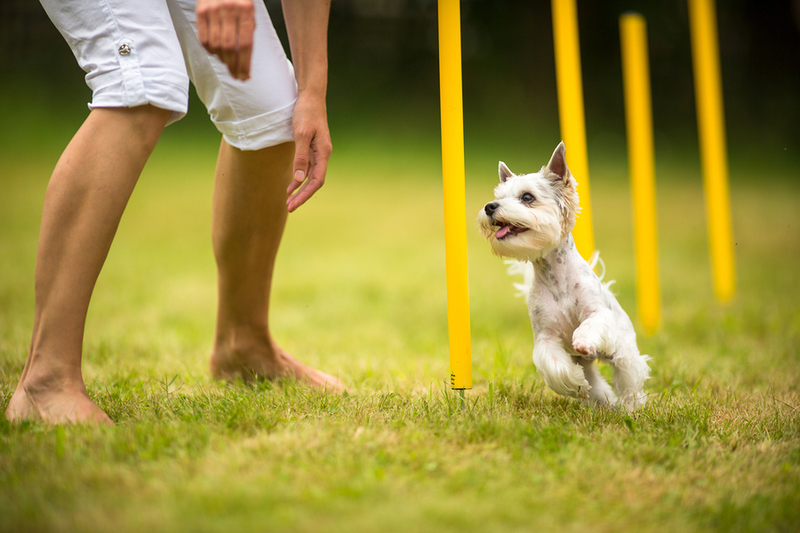 Though we don’t compete, our dogs have led very active (occasionally over-active) lives. We used to let the dogs off-leash immediately after getting away from the road. This always led to immediate, intense, racing – and subsequent strains. Our vet suggested we change up the pattern. I began unclipping Habi’s leash as she pottied, so she didn’t realize she was off-leash, and when she was engrossed in the local smells, I unclipped Obi and asked him to heel with me for a bit. Even if he wanted to zoom when I completely released him, Habi’s mind was by then on other things. What a difference! I also second the idea of bringing videos to the vet. Habi gets an adrenaline rush at the vet’s, which often masks any symptoms she may display at home. I love the idea to video your dog and slow it down. When my 2 year old was a pup, he just woke one morning limping a good deal. I watched for an hour or two then made an appt. When our afternoon vet appt came, not only was he not limping, but he was jumping and leaping. The physical exam showed nothing so the vet thought he’d be fine without treatment. The next morning he wouldn’t walk, just whined and waited for me to put him where he wanted. Clearly his vet show had made his injury and pain worse. I called the vet and insisted on an anti-inflammatory pain med and he cleared up in a few days. How much better it would have been if I’d taken a video at home. Correct me if I’m wrong please, but that would mean for a 60 pound dog, they would need 900 mg, or just under 9 capsules per day. I recognize that the label may state the amount needed for coat condition, but the difference (315 mg vs 900 mg) is significant and would make the product pretty cost prohibitive. I knew something was wrong with my son’s dachshund when she wouldn’t follow me up the stairs at home. At first I thought maybe she ate something because she was so “hard” in the belly. Turned out she had injured her back which is common in dachshund’s. I appreciate the info on pet massage and recommended supplements. Not just for her but all of my pooches!